Artist Frank Stella sang his praises in his American Heritage magazine essay, “The Artist of the Century.” Students in America’s art schools today are reaping what he sowed through his 40 years of teaching. Artists around the world employ his color theories. Through his own vibrant paintings and his pioneering teachings, Hans Hofmann has inspired generations. Hans Hofmann, son of Theodor and Franziska Hofmann, was born in Weissenburg, Bavaria on March 21st, 1880. When he was six years old, the family moved to Munich where his father took a job working with the government. Hofmann developed an interest in mathematics, science, music and art at a very early age. When he was sixteen, his father helped him obtain a job with the Bavarian government as the assistant to the director of Public Works. During this time, Hofmann further developed his technical knowledge of mathematics, even inventing and patenting an electromagnetic comptometer. Despite his exceptional gift for science, however, Hofmann soon gravitated towards the arts, and began his formal art training after his father passed away in the late 1800s. In 1898, Hofmann studied at Moritz Heymann’s art school in Munich. It was there that Hofmann was introduced to Impressionism and Pointillism, the burgeoning new art movements of the time. Early works (such as a 1902 portrait of Hofmann’s future wife, Maria (Miz) Wolfegg) show the influence these popular modes of painting had on the young artist; they also demonstrate his tremendous promise as an artist. Indeed, Hofmann showed so much potential that one of his instructors, Willi Schwartz, suggested that he travel to France to continue his studies. In 1904, with the financial support of Berlin art patron Phillip Freudenberg, Hofmann relocated to the center of all new developments in art: Paris. Miz later joined him, and the two lived in Paris for ten years during one of the most revolutionary periods in the history of Western art. Continuing his exploration at both the Academie de la Grand Chaumiere and the Academie Colarossi, Hofmann befriended many of the leaders of the Modernist movement. He also frequented the Café du Dome, a haunt of many artists and writers of the French avant-garde. There he became acquainted with pioneers like Matisse, Picasso and Bracques. His closest and perhaps most influential friendship was with Robert Delaunay, who, together with his wife Sonia, launched a mini-movement known as Orphism, or Organic Cubism. The Delaunay’s approach, with its emphasis on color over form, clearly made an impression on Hofmann. Both he and Miz helped design scarves for Sonia Delaunay’s Cubist fashions, and eventually Hofmann began to form his own color and composition theories, which he continued to develop and write about throughout his lifetime and later passed on to his many students. In 1908 and 1909, Hofmann exhibited his work with the New Secession in Berlin. Soon after,Hans and Miz left Paris and traveled first to Corsica where Hans could recover from a brush with tuberculosis. They then moved back to Germany to look after his ill sister, during which time the war broke out in Europe. Because of his German citizenship, Hofmann was not allowed to return to Paris and due to his lung condition he was disqualified from the army. Thus, he remained in Munich during the First World War and opened the Hans Hofmann School of Fine Arts in the spring of 1915. The school gained recognition worldwide when the war ended, and summer sessions in Capri, St. Tropez and Bavaria attracted many foreign students. 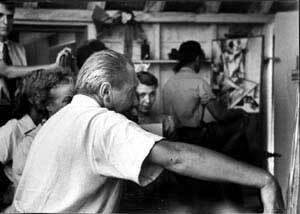 Glenn Wessels, Louise Nevelson, Carl Holty, Alfred Jensen and Worth Ryder were among Hofmann’s students at this time, and many of them stayed in touch with Hofmann over the years. In 1930, Worth Ryder invited Hofmann to teach a summer session at the University of California at Berkeley where he was the chairman of the Department of Art. This was the beginning of a meaningful long-term relationship between Hofmann and U.C. Berkeley,culminating years later in a special arrangement: Hofmann donated 45 paintings to the University on the condition that the school promise to construct an art museum on campus. In the spring of 1931, Hofmann returned to California to teach at the Chouinard School of Art in Los Angeles, and then resumed summer courses at Berkeley. Though he had little time to paint, he still managed to draw as much as possible, and he took advantage of the California climate and landscape to continue his artistic exploration of nature. His first public exhibition in the United States was held that year at the California Palace of the Legion of Honor in San Francisco. Meanwhile, in Germany, Propaganda Minister Joseph Goebbels created the Reichs Kammerce (Reich Chambers) for film, music, radio, broadcasting, press, theater and fine arts. The Reichs Kammerce carefully monitored the cultural details of German life, and procedures were established to deem what was acceptable expression and what was not. With hostility mounting towards intellectuals in Germany, Miz advised Hans not to return to Munich. In 1932 he settled in New York City, where he taught at the Art Students League on 57th Street. In 1933, Hofmann opened the Hans Hofmann School of Fine Arts at 444 Madison Avenue in Manhattan. Over the next few years, though the school would relocate several times, its reputation continued to spread. Art students from all over North America heard of the unique teacher from Europe who imparted to American students what he had learned from Picasso, Braque, Matisse and Delaunay. He became known as an instructor who allowed his students to explore and experiment with their own technique while still encouraging them to take their visual cues from the natural world surrounding them. A summer school was opened in Provincetown, Massachusetts in 1934, and Hofmann divided his time between the city and the coast.He thoroughly enjoyed being outdoors in nature, and after a prolonged period of only drawing, he finally began to paint again. In 1939 Miz joined him in America, and two years later he became an American citizen. Hofmann continued to teach in New York and Provincetown for the next twenty-eight years. During the 30s, 40s, and 50s, Hofmann’s dual role as teacher and artist would prove challenging for him. He remarked, “Being an artist and being a teacher are two conflicting things. When I paint, I improvise… I deny theory and method and rely only on empathy and feeling… In teaching, it is just the opposite, I must account for every line, shape and color. One is forced to explain the inexplicable.” Nevertheless, he was an enormously generous teacher, and despite his broken English (which was often peppered with German and French), he was a wonderfully expressive and attentive presence in the classroom. He gave his students one-on-one critiques, often drawing a tiny composition of his own in the corner of their works to illustrate one of his points.His impact as a teacher is still palpable today, as his theories of the “push and pull” of color and of breaking up the picture plane are still being disseminated by art teachers all over the world. Three years later, Miz Hofmann died suddenly. Hofmann painted “Paz Vobiscom” in her memory and continued to paint magnificent major works. In 1965, Hofmann married a young German woman, Renate, and painted a loving, glowing series of masterworks dedicated to her, which are now in the permanent collection of the Metropolitan Museum of Art. On February 17, 1966 Hofmann died at the age of 86. On his easel was another painting, almost finished, dedicated to Renate. Retrospectives and exhibitions continue to this day, and his work is in permanent collections in galleries and museums from New York to New Zealand. In addition to his paintings, Hofmann’s continuing legacy includes not only those students who became accomplished artists, but also those who became teachers and mentors themselves, spreading Hofmann’s influence far beyond even the large numbers he taught. Hofmann was recognized for helping students find their own distinctive ways to practice art. He never insisted that they become abstract artists; in fact, most of his students never saw his own paintings until after he had retired from teaching. Instead, he encouraged them to frequent museums and galleries, often exposing them to new styles of art. Former Hofmann students include : James Gahagan, Red Grooms, Lillian Orlowsky, Wolf Kahn, Paul Resika, Mercedes Matter, Irving Kershner, Roberd DeNiro Snr, Myrna Harrison and Frank Stella.